LT William Outerbridge was new to command. The Lieutenant and veteran of 14 years of service had taken command of the elderly destroyer USS Ward (DD 139) less than 24 hours before she began her weekend Anti-Submarine patrol of the entrance to Pearl Harbor. In the inter-war years promotion was slow and opportunities for advancement slim. Outerbridge had been commissioned following graduation from the Naval Academy in 1927. He was the only Regular Navy Officer on the ship. The Ward was old but had very few miles on her. 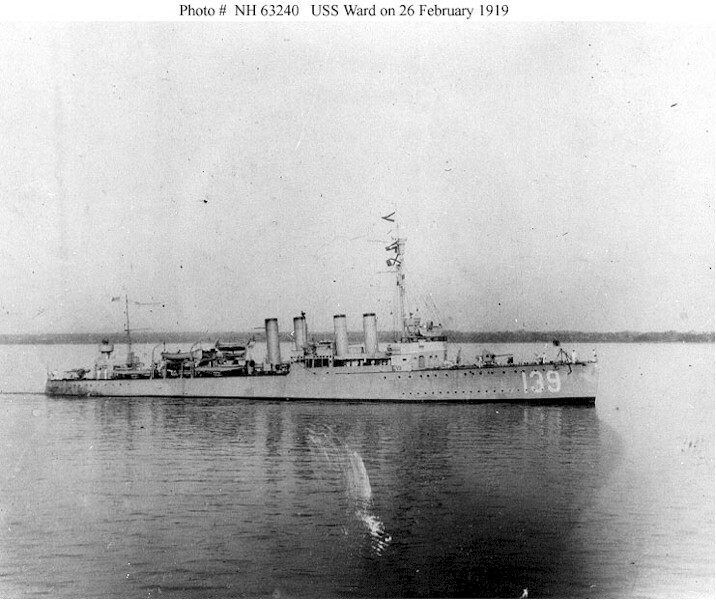 A Wickes class destroyer of 1250 tons and armed with four 4” 50 caliber and two 3” guns she was launched and commissioned in 1918 and was decommissioned and placed in reserve in 1921. Recommissioned in January 1941 she was assigned to Destroyer Division 80 at Pearl Harbor. This squadron of elderly ships consisting of Ward along with USS Schley, USS Chew and the even older USS Allen was assigned to the Inshore Patrol Command. As tensions between the United States and Japan increased the War Department and Department of the Navy issued a “War Warning” and Admiral Husband Kimmel, Commander in Chief Pacific Fleet ordered a “shoot on sight” against any ship or submarine operating in the security zone outside Pearl Harbor which effectively put the ships of DesDiv 80 on a war footing. Outerbridge had taken command on Friday December 5th and taken the ship to sea 6th at 0628. He had no idea that in just over 24 hours the guns of his ship would be the first American warship to fire at an enemy combatant in the Pacific during the war. As the Ward patrolled the area just a couple of miles off of the entrance to Pearl Harbor the minesweeper USS Condor (AMc-14) spotted a white wake near her at 0342. The Officer of the Deck and Captain determined that it was the periscope of a submarine. They signaled the Ward which was patrolling nearby: “Sighted submerged submarine on westerly course, speed nine knots” at 0348. Outerbridge ordered the Ward to general quarters. After a futile search Outerbridge secured from General Quarters at 0443. At 0458 Pearl Harbor’s anti-torpedo net gate was opened to allow passage of Condor and a number of other small ships including the Stores Ship USS Antares (AKS 14). Antares was towing a target back to base when at about 0635 a lookout on Ward noticed a wake following the auxiliary between her and her the raft. Outerbridge returned to the bridge and sounded general quarters at 0640. Outerbridge increased Ward’s speed to 25 knots and commended firing on the sub at 0645. 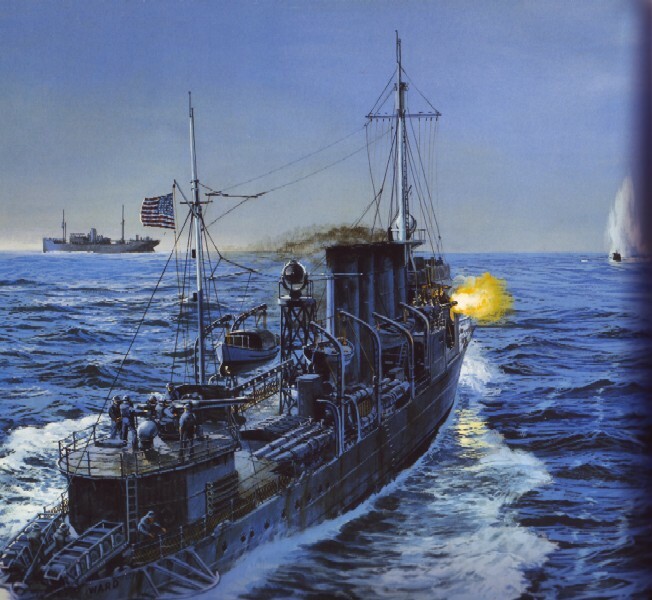 Ward’s number three gun scored a hit at the base of the sub’s conning tower and Ward charged the sub. Coming close alongside the Ward dropped depth charges which sank the sub. Outerbridge notified harbor control at 0651 sending the message “Depth bombed sub operating in defensive sea area.” Some of his own officers thought that it was possible that Ward had attacked an American submarine but Outerbridge was confident that the sub was hostile. To emphasize that this was different from false alarms that headquarters was accustomed sent another message at 0653 “Attacked, fired upon, depth bombed, and sunk submarine operating in defensive sea area.” It was just over an hour before the first Japanese planes would begin their bombing runs. Delays in seeking more conformation and reluctance to believe the report resulted in the message not being rapidly transmitted up the chain of command. It was a symptom of a parochial and divided command structure which did not respond quickly to the needs of war. The rest is history. 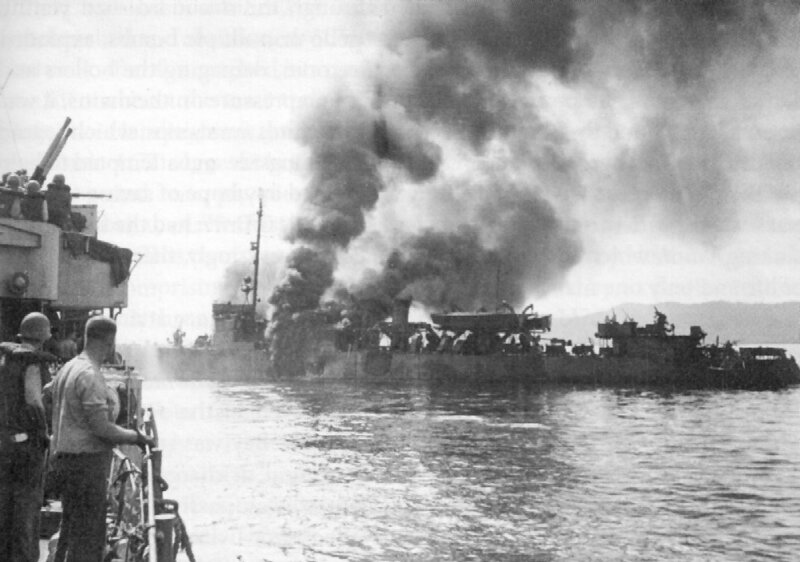 Within two hours the Battle line of the Pacific Fleet was sunk or crippled, all told 18 ships were sunk or damaged. 2402 Sailors, Marines and Soldiers were killed and another 1247 wounded. Ward war was not over. She was converted to a Fast Transport and redesigned APD-16 in 1943. She participated in actions in the Solomons, New Guinea and the Philippines. On December 7th 1944 while conducting operations at Ormoc Bay the veteran ship was hit by a Japanese “Betty” Twin engined bomber. The large aircraft acting as a Kamikaze crashed into Ward and started fires and flooding that could not be controlled. One of the ships that came toWard’s assistance was the USS O’Brien (DD 725) commanded by LCDR William Outerbridge. The same officer who had commanded Ward at Pearl Harbor. Three years to the day after sinking the Japanese submarine LCDR Outerbridge was ordered to sink his former ship after rescuing her crew. Outerbridge retired as a Rear Admiral in 1957 and died in 1986. Like others of his generation he served in war and peace. 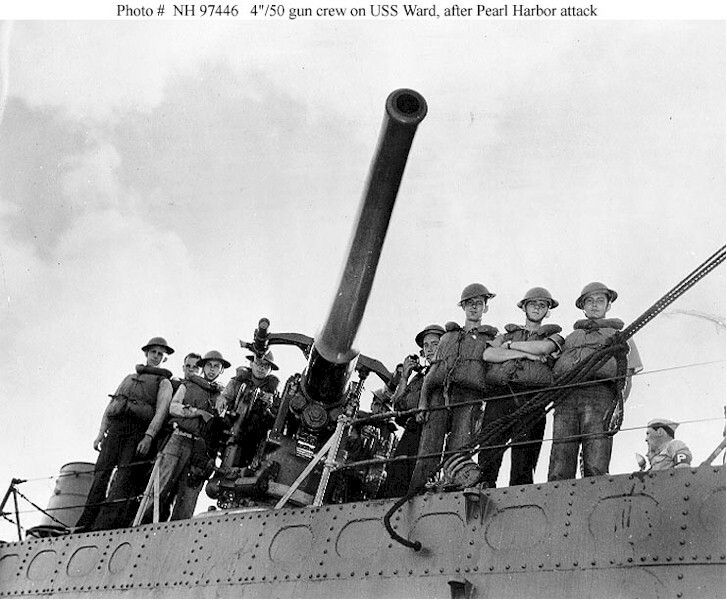 As we remember the attack on Pearl Harbor let us not forget him as well as the fine crew of the USS Ward. These men were alert that quiet Sunday morning 70 years ago and took action. They sunk a Japanese midget submarine intent on entering Pearl Harbor and reported their actions. One wonders what might have happened if Outerbridge’s reports had been acted on, interceptors scrambled and anti-aircraft defenses on ships and ashore been ready when the Japanese attackers swept in to attack Pearl Harbor. Of course we will never know.